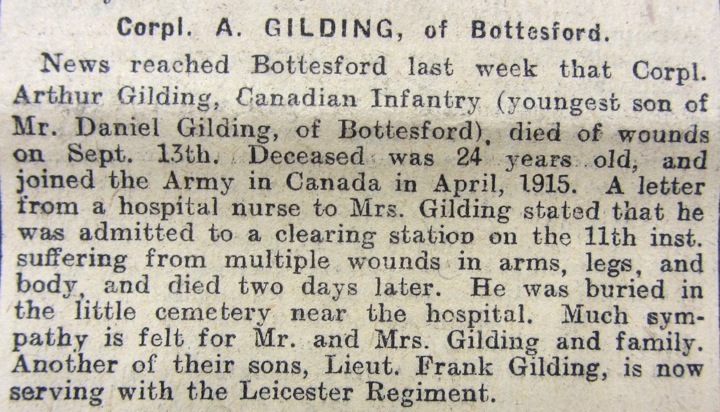 Arthur Gilding was one of five men named on the Bottesford War Memorial who served with the Canadian Expeditionary Force (CEF) during WW1 – Charles Bend, Arthur Gilding, Frank Raithby, Charles Pacey and Robert Turlington Noble Page. All five emigrated to Canada in the early 1900s. None would survive. A national competition was organised and prizes were awarded to those pupils who performed best in a written examination of the history, geography and resources of Canada. Victor Collett the headteacher at Bottesford School noted in the logbook that ‘the examination papers were adjudicated in London and Frank Gilding who was placed first has been awarded a bronze medal as a prize, Lizzie Hallam was second.’ Frank was Arthur’s elder brother and Herbert Hallam, a relative of Lizzie, who had previously emigrated to Canada with his wife Martha and their six children, provided Arthur with his first employment as a farm labourer in Oak Lake, Manitoba. However, Arthur did not continue with agricultural work because by May 1915 on enlistment some 400 mile east in Saskatoon, Saskatchewan he was working as a butcher. Charles Pacey had also settled in Saskatchewan, east of Regina in Rosetown, where he worked as a waiter. The 60 hour week as an agricultural labourer would have been arduous in the extreme weather conditions of both the cold winter and the heat of summer in Manitoba and Saskatchewan. Butchery and waiting would no doubt have offered better conditions. Not heard from Saskatoon yet so he (Arthur) must have joined the Army. I guess we will have to wait for a while. He did not have to wait long for news. On the 9th November 1915 Arthur was posted with reinforcements to serve with 8th Canadian Battalion alongside his friend Charles. 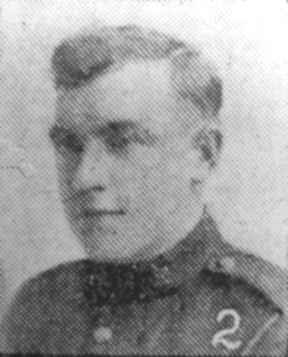 He was one of a draft of 13 men to join the battalion on Sunday the 14th November. By that time the 8th Battalion was a battle hardened unit that had taken many casualties. 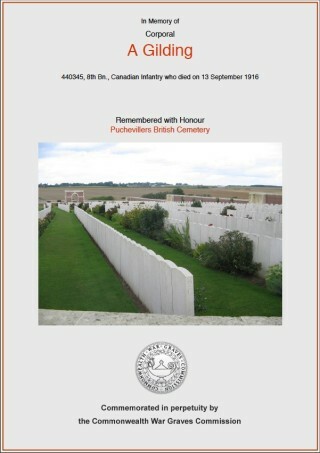 Arthur joined them just as they were placed into Divisional reserve for a short period of rest and training. Within a week they were back in the front line in exceptionally wet and muddy conditions in the south of the Ypres Salient near Messines. Such conditions would be the hallmark of Arthur’s service experience for the rest of that cold winter. Over the next four months Arthur must have performed well as part of the routine of rotating in and out of the front line in that sector of action. In mid April he was promoted to Lance Corporal and sent to ‘Gas School’ for training. In June the battalion took very heavy losses during the Canadian assault on Mount Sorrel. Over half the 570 officers and men in that action were killed, injured or missing. Arthur Gilding survived but Charles Pacey was injured. Despite those heavy losses by the end of the month they were back into the front line trenches at Mount Sorrel and experiencing heavy shelling. They were withdrawn from the front line on the 6th July and on the 17th July just prior to further front line duties Arthur Gilding was promoted to Corporal. That period action was the last of Arthur’s service in Flanders. Soon after the 8th Battalion was transferred to take part in the final stage of the now stalled Somme offensive. By the 5th September they were in the reserve on Tara Hill east of Albert prior to front line action the next day. On the 9th September over 200 German soldiers assaulted their position. Arthur survived that attack. The battalion then moved east to La Boiselle on the 10th September and the next afternoon its battalion headquarters was shelled. 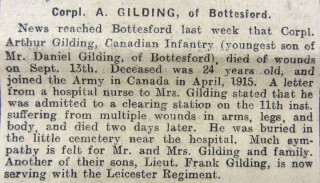 Arthur Gilding sustained severe injuries as the only casualty of that attack. Soon after news reached his parents that Arthur had died as from multiple wounds on the 13th September in the 3rd Casualty Clearing Station. The Rev. Knyvett officiated at his burial in the nearby Puchevillers Military Cemetery. Arthur’s loss also had a significant impact on his friend and comrade Charles Pacey, spurring him on in his arduous work as a stretcher bearer. Sadly by the end of 1916 there would be two more casualties from those of the five men from Bottesford who had volunteered to serve with the Canadian forces. In October Turlington Page was missing in action in the final stages of the Battle of the Somme and Charles Pacey was killed in action on the Vimy Ridge in December 1916.